Who was Orion, and why did almost no one paint his story? Nicolas Poussin (1594–1665), Landscape with Orion, Blind Orion Searching for the Rising Sun (detail) (1658), oil on canvas, 119.1 × 182.9 cm, Metropolitan Museum of Art, New York, NY. Wikimedia Commons. The vast majority of mythology paintings drew on well-known compilations of classical myths, of which the best-known and most popular was Ovid’s Metamorphoses. For the most advanced artists, Ovid and the common sources were unnecessarily restrictive, although other more ancient compilations, such as those of Hesiod, were not as readily accessible. Every cloudless night, we are reminded of one myth which never made it into the standard works. For anyone, wherever they are in the world, one readily recognisable constellation which will be visible in the sky is that of Orion, the hunter. How he came to be catasterated is not at all well known, and neither you nor Nicolas Poussin can find it in Metamorphoses. 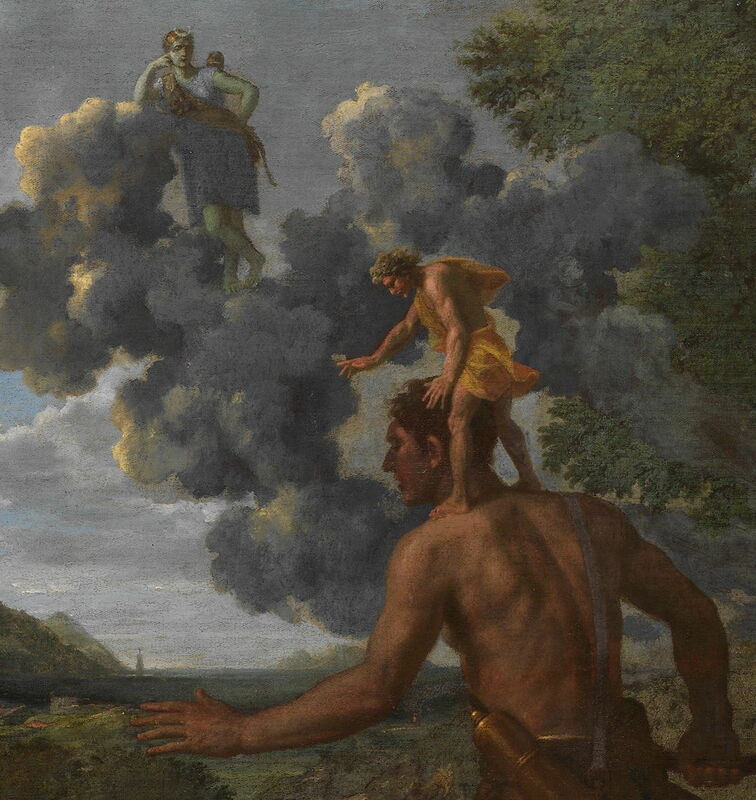 Orion was a giant, the son of Poseidon and Euryale, the daughter of Minos. He arrived at Chios, where he became drunk, and raped Merope, the daughter of Oenopion. As punishment for that, Oenopion blinded Orion and cast him from his land. Orion then went to Lemnos, where Hephaistos took pity on him, and lent him his servant Kedalion to sit astride his shoulders and act as his guide. An oracle advised Orion to proceed east, into the rays of the rising sun, so that those rays would restore his sight. Cured, Orion then went to Crete to hunt. There are different accounts of Orion’s death. Some involve his love affair with Eos, which was opposed (possibly out of jealousy) by Artemis. In these, Artemis ended up killing Orion with her arrows. Other versions claim that he was killed by a giant scorpion. In death, Artemis asked that Zeus catasterised him (transformed him into a constellation), together with the scorpion, forming the constellation Scorpio. Once there, Orion pursues the daughters known as the Pleiades, which form a prominent open star cluster nearby. Nicolas Poussin (1594–1665), Landscape with Orion, Blind Orion Searching for the Rising Sun (1658), oil on canvas, 119.1 × 182.9 cm, Metropolitan Museum of Art, New York, NY. Wikimedia Commons. Poussin’s Landscape with Orion, or Blind Orion Searching for the Rising Sun was painted very late in his career, in 1658, at a time when the artist’s hands were suffering a tremor which was starting to disrupt his ability to paint. It is among his finest allegorical landscapes, and one of the most intensely studied works of his career. 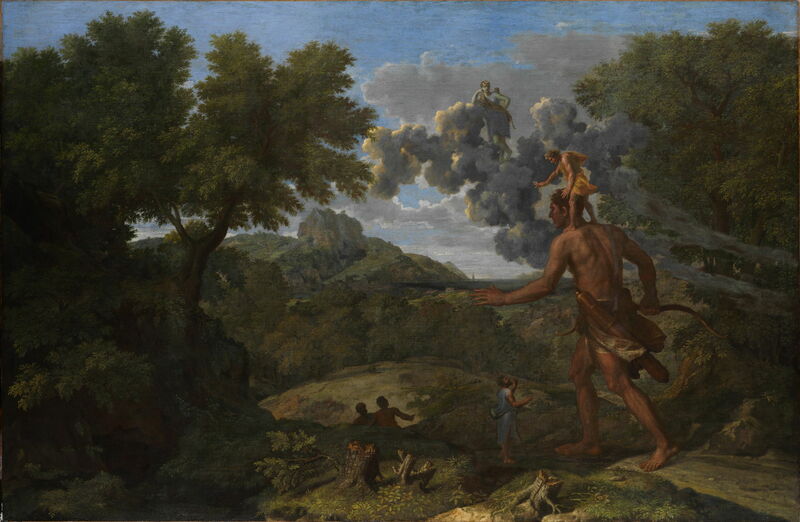 Set in one of Poussin’s wonderful idealised landscapes, near the coast, the giant Orion is striding purposefully towards the rising sun. He carries a huge hunting bow, and a quiver taller than a man. Standing on his shoulders is Kedalion, servant to Hephaistos, who is acting as his guide. Above and beyond Orion is a strange formation of backlit cloud, which is generally interpreted as being stormcloud. Atop that cloud is the standing figure of Artemis, with her distinctive crescent moon coronet, and an owl perched on her left shoulder. She leans nonchalantly against the cloud, her head propped against her right hand. Kedalion is talking with a man down by Orion’s feet, and two others are in the shade further down the path along which Orion is striding. In the far distance is the sea, with a prominent lighthouse. Artemis, Kedalion, and Orion’s torso and left leg form an arc, the centre of which is in a dark grotto in the left foreground. Poussin was clearly drawing on a source of myth, but it was not until 1944 that Ernst Gombrich identified that as a French edition of Natale Conti’s (also Natalis Comes) Mythology, rather than a classical source. This indicates that the figure standing by Orion’s feet is Vulcan, who is also helping to guide the giant. The clouds show both a dissipating storm, which in clearing will expose Orion to the sun’s rays and restore his sight, and the meeting of the elements of air, water, and the sun. Those refer to Orion’s triple paternity (according to Conti) of Zeus, Poseidon, and Apollo (who is also twin sister of Artemis). Earlier in his career, Poussin may have used Alberti’s rules to tell this story, in facial expression and body language. With Orion and Kedalion facing away from the viewer, and a limited range of gestures too, those rules have been largely ignored. What results is a superbly integrated narrative with one of his finest landscapes – despite his terrible tremor. Daniel Seiter ( –1705), Diana by the Corpse of Orion (1685), 116 × 152 cm, Musée du Louvre, Paris. Image by Musée du Louvre/A. Dequier – M. Bard, via Wikimedia Commons. There have been precious few other attempts to tell any part of the story of Orion on canvas. In 1685, Daniel Seiter ( –1705) painted this view of Diana by the Corpse of Orion, following in the brushstrokes of his teacher Johann Carl Loth. Both show Diana (Artemis), with her distinctive crescent moon, looking regretfully at the dead Orion – after she had killed him with her arrows. This Orion is no giant, and neither teacher nor pupil suggest why Diana should mourn the man that she had just killed. They also do not make any link with his imminent catasterisation. 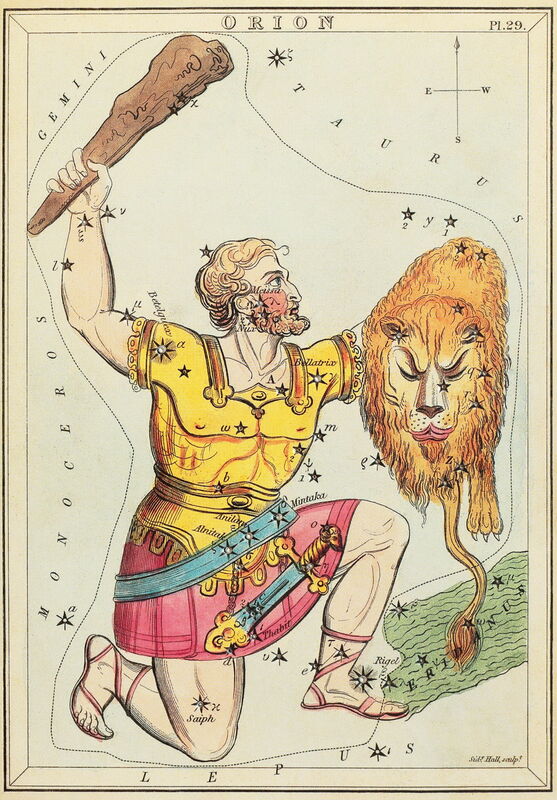 Sidney Hall (1788–1831), Orion (1825), etching, hand-coloured, plate 29 in Urania’s Mirror, set of celestial cards, location not known. Restoration by Adam Cuerden, via Wikimedia Commons. Sidney Hall’s etching of Orion, a hand-coloured plate in a set of celestial cards from 1825, is an ingenious lesson in observational astronomy, but shows how little-known the myths of Orion remain. Sadly I have been unable to locate any image of another significant painting of Orion made by George Frederic Watts in 1895, but that really is about the lot. That only serves to emphasise just how special is Poussin’s painting. Posted in General, Language, Life, Painting and tagged myth, narrative, Orion, painting, Poussin, Seiter, Watts. Bookmark the permalink.